The centerpiece of Ann Arbor's summer is returning July 20-23 with the 58th edition of the Ann Arbor Art Fair, bringing thousands of art lovers to the city's downtown. Hundreds of artists will offer pieces in a wide variety of mediums at four separate fairs that combine to form one big event. * The Ann Arbor Street Art Fair stretches throughout Ingalls Mall and along East Washington and North University, between Fletcher and South Thayer. * The State Street Area Art Fair is located on State Street between Washington and William, on North University from State Street to Thayer, as well as on East Liberty, from the nonprofit booth area to State Street. It also is located on Maynard, from East Liberty to Jefferson, and on William, from Thompson to State Street. 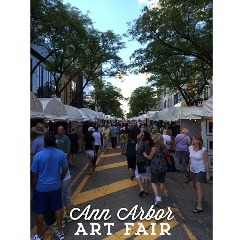 * The Guild's Ann Arbor Summer Art Fair has two locations near the UM campus and in the downtown area. The campus location is on State Street from Madison to William and the downtown location is on Main Street from William to Huron, and Liberty Street from Ashley to Fifth Avenue. * Ann Arbor's South University Art Fair stretches the entire South University Avenue area and into parts of State Street. Hours: 10 a.m. to 9 p.m. Thursday, July 20, through Saturday, July 22; and noon to 6 p.m. on Sunday, July 23. For visitor information visit the art fair website. Traveling to the fair by shuttle: Shuttle opportunities are available throughout the fair as both The Ride and Trinity Transportation offer services at a trio of stops. Trinity will have a Park & Ride shuttle stop at Huron High School, 2727 Fuller Road, which offers two different drop-off points: Fletcher and Washington and South University at Forest. Parking is free, and the round-trip cost is $3. Children 5 and younger ride free. This shuttle operates on Thursday through Saturday from 9 a.m. to 10 p.m. and from 11 a.m. to 7 p.m. on Sunday. The Ann Arbor Transportation Authority's TheRide will pick up passengers from Pioneer High School, at 601 W. Stadium Blvd., on Thursday through Saturday. Stops will be made at Main Street at William and on State Street near South University. Parking is free, and the shuttle fare is $3 round trip, or $1.50 one-way for adults; 75 cents one-way for high school students and AATA Fare Deal cardholders; and children 5 and younger ride free. This shuttle runs from 9 a.m. to 10 p.m.
Trinity will operate the shuttle leaving Pioneer High on Sunday with $3 round trips and free rides for children five years old and younger. The Sunday shuttle from Pioneer runs from 11 a.m. to 7 p.m.
TheRide also operates the shuttle at Briarwood Mall (near Sears) on State and Eisenhower. Parking is free, and the shuttle fare is $3 round trip, or $1.50 one-way for adults; 75 cents one-way for high school students and AATA Fare Deal cardholders; and children 5 and younger ride free. Stops at Main and William, and State near Madison. Buses return to both parking locations from either shuttle bus stop. The shuttle runs from 9 a.m. to 10 p.m. Thursday through Saturday and from 11 a.m. to 7 p.m. Sunday. Parking and traffic: If you don't use the shuttle services, be warned, parking and traffic downtown is chaotic during Art Fair. Many downtown streets are closed and other area road closures and construction will impact travel times and convenience. City parking structures will have all-day rates, and U-M parking decks will have evening and weekend parking. Rates are $15 per day, $7 after 5 p.m. Check out this interactive map to find public parking options in the city. Bus detours: Regular Ann Arbor Transportation Authority bus schedules are affected by the fairs. The full list of impacted routes can be found on the AATA website. Art Fair Art-Go-Round: Art-Go-Round is a free, inter-fair shuttle that travels the fairs' circumference all day. The air-conditioned shuttle runs every 15 minutes and are wheelchair accessible. Wheelchairs: A limited number of wheelchairs will be made available, thanks in part to Evangelical Homes of Michigan. They will be located at State and Madison and Washington and Fletcher. Weather: Although a lot can change in the forecast, the extended weather outlook for this year's fair looks good, so far. The Weather Channel predicts mostly sunny skies on Thursday through Saturday, with only Sunday presenting the possibility of scattered thunderstorms. High temperatures are expected to be in the high-80s throughout the weekend. MLive will provide weather coverage if it's expected to impact Art Fair activities. Food and drink: Several food courts are set up throughout the fairs serving a variety of food and drinks. Restaurants and bars are also open in the areas where the four festivals are operating. Townie Street Party/Dart for Art: Ready to start the art fair festivities a few days early? Kick things into high gear by participating in the Dart for Art - an all-inclusive 1-mile race, with divisions for elite athletes, local runners, families and children. Registration for the race is $25 before July 16 or $30 the day of the race, which begins at 6 p.m. on Monday, July 17. Click here for a map of the course. The race is held in conjunction with the annual Townie Street Party, which takes place from 5 to 9:30 p.m. on July 17. The party celebrates all things local and is the city's way of thanking Ann Arbor residents for hosting the Ann Arbor Art Fair each year. The party live music from area bands, food and drinks at the townie pub. The party takes place on North University between Thayer and Fletcher and on North Ingalls Mall. For the family: The Ann Arbor Street Art Fair hosts the Art Activity Zone, with hands-on projects for adults and children. The activity zone is located on Ingalls Mall and runs from 11 a.m. to 6 p.m. Thursday through Saturday and from noon to 6 p.m. Sunday. Kid-friendly art projects include the Legoland Discovery Center, a mixed media mosaic and a figurine making station, with stations hosted by Flipside Art Studio, Clay Work Studio, University of Michigan Museum of Natural History, Cranbrook Art Museum and Detroit Institute of the Arts. Entertainment schedules: Live entertainment can be found throughout the fairs and schedules are available online. Three stages offer free entertainment: Fountain Stage, presented by the Ann Arbor Street Art Fair; The Ann Arbor Summer Art Fair Stage and the Main Stage at the South University Art Fair. Artist directory: Hundreds of artists from across the country and beyond are expected in Ann Arbor for the weekend. Art Demo Zone: Take a break determining what you're going to purchase to get a look at the creative process of some of the artists on hand for this year's fair. Artists will demonstrate how they develop their unique works of art in the Art Demo Zone, located under the big maples on North University. Artists will be on hand from 11 a.m. to 8 p.m. Thursday through Saturday and noon to 4 p.m. on Sunday.